These genuine Caframo/Calfire Ecofans are heat-powered ecofans designed to circulate the warm air created by a wood or gas stove. They help heat up the room more quickly and efficiently. You'll use less fuel and feel more comfortable with one of these stove top fans. They're ideal for woodburners and multi-fuel burners. Height 222mm (8.75”) from base to top of casting, excluding handle - This is the maximum height. For smaller rooms choose the Ultrair 810, it moves up to 125 cubic feet of air per minute, saving you 14% on fuel. For larger rooms choose the Airmax 812, it moves more air, up to 175 cubic feet per minute, saving you 18% on fuel. The Ecofan 810 is designed to be used on freestanding stoves with normal surface temperatures on 100°C - 345°C. Temperatures above 345°C may damage your Ecofan. Relocate your Ecofan to a cooler spot on your stove if the surface temperature exceeds 345°C. Good wood stove practice includes using a stove thermometer. Sold with 2 year warranty. The only fully CE compliant stove fans on the market…. 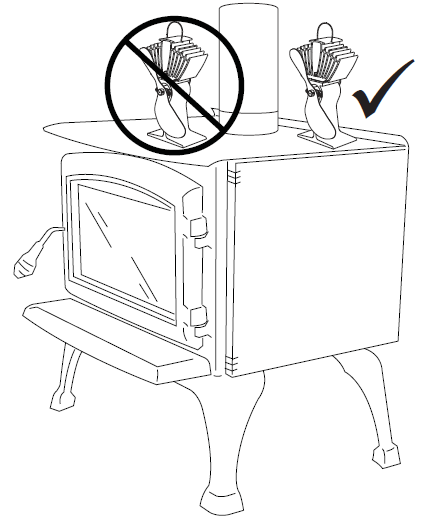 None of the Chinese copy stove fans meet this approval despite what is printed on the boxes or their importers claims. Moves up to 125 CFM (cubic feet of air per minute). Even at only 100°C this Ecofan will still move a very useful 50 CFM. Provides a fuel saving of up to 14%... only genuine Ecofans have been independently tested to prove this. Feel the heat 31% faster with the 810 UltrAir Ecofan (compared to using your stove with no stove fan). The 800 Original Ecofan is a good basic wood stove fan, it operates at a lower level of air movement and comes with a 1-year warranty. Click the button below to add the Caframo - Ecofan 810 Ultrair Wood-Stove-Fan to your wish list.